A few weeks ago I was introduced to an idea that was hatched. An idea of an engineer who looked at the facts and figures and thought, we can actually do this. It has been tickling my brain ever since. 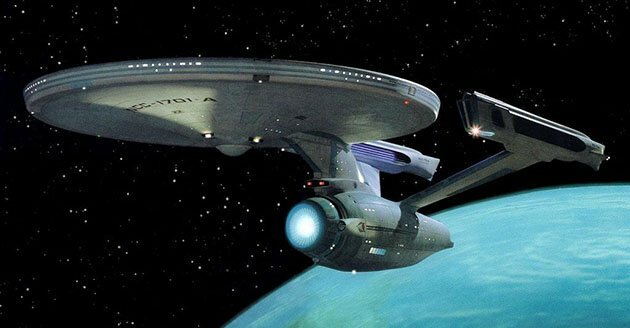 The Build the Enterprise project is an idea that, with about $1 Trillion and 20 years we could build a first generation Starship Enterprise with technology comparable to our own. When I first saw this idea I thought to myself that, hey no, I would donate money to this, where is the Kickstarter (an idea which has apparently been officially dismissed by the project founder)? This idea had propagated and was passed all over the net and various news sources to the point where the website was overwhelmed and had to invest in a private server to keep up with the attention. The proposal, from a 30 year systems engineer and electrical veteran of a Fortune 500 company named"Dan," touts some rather fantastic ideas, like the fact that if we started working with the technology we currently have now, that in 20 years we would have the first generation Enterprise, complete with a 100MW lazer, gravity well, and propulsion that could get us to Mars in 90 days. Dan has written a comprehensive white paper plan that includes a funding proposal (to go through Congress and NASA) that already includes inflation and other negligable differences for costs and, according to his plan, a new version of the "USS Enterprise" could be developed every 33 years, giving each new generation a starship of its own (this means WAY more space jobs...). Some may pass this off as a strange idea or even as a waste of money I would have to disagree with those aspersions. An argument that has been put forward is that this effort may not yield the desired results, that there are no guarantees that this investment will bear fruit. I wholeheartedly disagree with the very essence and this argument. How many advances could be made just from accidental discovery or through hard work through these field just by investment? Remember the space race? It was an era of fear and competition with the Communists but it was also an era of hope and pride in our country, especially surrounding our space exploration and "space-age" technology. This could be a grand project that could unify us, bring us together not just as a country but as an international people; a species. A project to say, "Hey Universe, look what humans can do!" I don't want to go into the arguments that, in the long run the only way for our species to survive is to "get off rock," or go into our resource depletion statistics, or even the fact that this would bolster scientist and scientific efforts all over the world, from America to Egypt. With private sector projects like SpaceX already launching projects and even more endeavors on the way it seems like us in outer space is relatively inevitable. My one concern is that it will be corporations who provide the endeavor and not governments or humans as a whole. We live in a world where the mechanisms that would have lead our path towards a more unified human government and effort are being strained and tested; the Euro seems on the verge of dismantling, the UN is still a toothless body with few international successes that bring the world pride. The world made an estimated US$61.96 trillion in 2010 terms of GDP. The United States made around $15 trillion of that total. Sure we could use the money to feed x amount of people, or work towards cleaning our environment or increase education, which I am all for, but I don't understand why we can't do both. I find it a facil argument that this money would be better used elsewhere, honestly that is how I feel about a large portion of the American budget (look at militar spending, non-renewable energy subsidies, prison system spending, etc). In my mind this is an investment in our future, not just America, but the world as a whole. This effort would drive industry, investment, job growth and a state of "awe." Maybe I just hope we boldly go, where no man has gone before, in my lifetime.